had engineers' inspections, and expect certification this month. The program is being operated through Earth College. Now considering offers above $6,300,000! 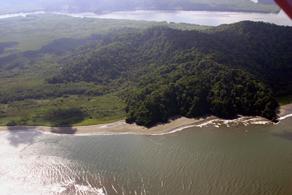 In the photo below, the Rio Sierpe divides the north edge of the Osa Peninsula from Violin Island. The river flows from left to right - east to west - in this photo. Barely visible on the far side - the Osa Peninsula side - of the river is the lodge and part of the 2239 acres comprising the Finca la Florida, which has not only river but also ocean views. 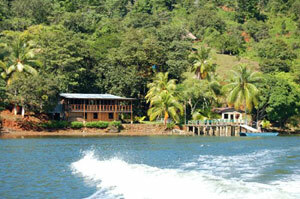 The finca is reached both by boat and road. 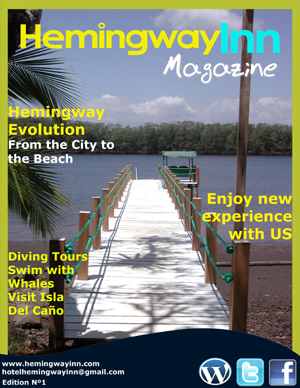 Airports are located to the east near Sierpe and to the west near Drake Bay, a location famous for its whale-watching, fishing, and scuba-diving. An international airport is still planned for this region and construction is supposed to be imminent. This majestic finca has about 4 miles of river frontage, 2,000 acres of grand old-growth rain forest, and resident wildlife like jaguars and macaws, three kinds of monkey and wild boar. The property reaches an elevation of 420 meters, with cool breezes and views out over the ocean. The total size of the property is 2239 acres, about 906 hectares. The property divides naturally into three areas for future development - approximately 1235 acres (500 hectares) for timber harvest and forest management; 75 acres (30 hectares) for the tourist lodge, research station, cabins, open field building sites and forest trails; and 925 acres (375 hectares) for low density, sophisticated residences. The current owner has planned for the lodge to serve as a center for naturalist studies. Income from tourism will help to support local resource management and planning, including the development of human resources, which, he says, is sadly lacking in rural Costa Rica. He is beginning with vocational training in woodworking. 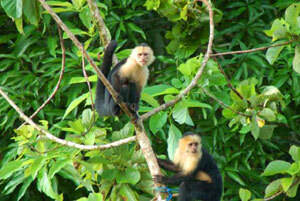 The research opportunities on La Florida are very diverse. This property, which has not been logged for 40 years, is home to a large variety of native flora and fauna. 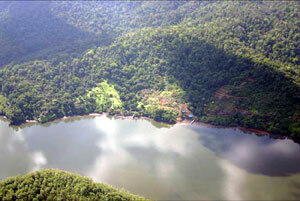 The ecosystems, from the mangroves to the high forest, have not been disturbed by human activity for these many years. The lodge has hosted Masters thesis candidates and undergraduate classes, and will continue to do so. Education here, says the owner, is a key to ecological survival in cooperation with local human communities.